This is a story of Omer Savat from St - Laureins (Meetjesland), who was born in 1911, spent his whole life in that beautiful farmer's parish, and was an avid bird -catcher. He told the local history society, how they went to work at catching Siskins. To make their bird glue linseed oil was boiled that long that it caught fire. If the glue does not burn we wanted ignite it, stuck with a burning cutting. Then the flames were extinguished with a wet burlap sack and was checked if the result was sticky enough: if one took a bit of it between thumb and forefinger, one had to struggle to make back from each other apart. When the glue was not strong enough, he was boiled again until the fowler was satisfied with the result. The glue cooking was done outside in the open air, on a wood fire between three bricks, on which the glue boiler was put. It was a chore that smelled like the plague, so far enough from the house had to be concocted. And there also had to take into account the direction of the wind. ... and at the appropriate time, with a flick of the glued areas of knitting needle or wire were pressed against the bird. They covered the birch branches with mistletoe (glue) hung enough alder catkins on, and made a cage with a decoy sisken in. The Siskins were also caught with clap net and pull net, but that happened at a distance from the alder sides. The clap net was hung in the orchards, and the pull net just worked in the meadows. In both cases were decoy birds used (“call babes”) to call flying birdiess. 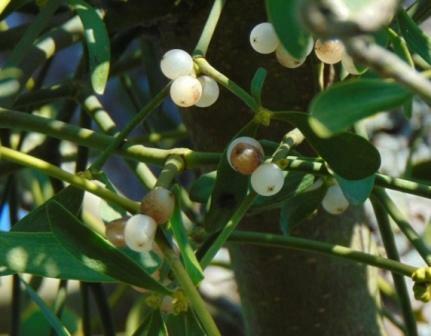 Traditionally, there are used honey, or glue from the ripe berries of mistletoe (Viscum album). 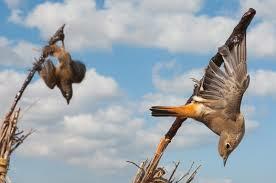 This period begins in Spain the yearly tradition to catch thrushes with glue. That is actually illegal, but there is virtually no control. The Spanish claim that it is a tradition that goes back to the time of the Romans. The estimated four million birds die a horrible, slow death, and finish especially on the menu of tapas bars. The birds are lured with MP3 speakers in the (industrial) glue traps. Two out of three birds are not the intended thrushes, but other birds that migrate around the same time as robins, black cups, warblers, black redstarts. Even though a lot of endangered owls species occur in the glue traps. Furthermore, in Europe as protected birds, end up as appetizers in Spanish stomachs. Approximately 140 million migratory birds also come each autumn in traps of Egyptian bird hunters to be sold as delicacies and end up on the grill. Biologist Eddy Dupae of the Flemish Land Agency tells a different story. Mistletoe allows the great thrush to survive here in winter instead of migrating. The bird needs a colony of mistletoe for this. That's why they both maintain each other. It is the only known strong symbiosis between animal and plant in Western Europe (a 1 to 1 relationship). The great thrush defends her colony (except against a force majeure, she just joints the dinner with them, and then migrates along). The fruit is the most high-fat berry in this region, therefore it does not freeze. Mistletoe 'breathes' differently from all other trees and plants.Plants and trees breathe (especially at night) a part of the oxygen by a process in the mitochondria of their cell, in the protein complex 'Complex I'. But mistletoe has no Complex I in its mitochondria at all. Their breathing process takes place in the cytoplasm and that is called glycolysis. In the plant kingdom there are no known other species that rely on glycolysis for their breathing. The spread of the mistletoe does not happen by rubbing the beak (with sticky seeds) or by its pooping, but by a kind of vomit ball. The seeds are unpalatable and heavy. It is not energetically interesting to fly around with them in the stomach or intestinal tract. The great thrush has - also unique to the species - a crop that separates the seeds from the flesh before it goes to the stomach. The seeds are then vomited. This way the large thrush can (usually) continue to overwinter here. Mistletoe (Viscum album) is an evergreen plant of the sandalwood family (Santalaceae). Deviant to other plants he not roots in the ground to grow up, but lives on trees, and is not heliotrope, the leaves do not grow to the sunlight, but centrifugally from the core of the plant. Avers to gravity direction it grows at right angles to each place he adheres. The leaves have no difference between the top and bottom side. The plant is found on trees in calcareous soil (South Limburg): Canadian poplar (Populus X canadensist) (never on black poplar), Acacia (Robinia pseudacacia), fruit trees, especially apple (Malus sylvestris ssp.domesticus), Hawthorn (Crataegus monogyna), rowan, oak and lime (Tilia sp.). Mistletoe on an oak tree is very rare, and that was exactly why is was sacred to the Germans and the Celts. The mistletoe is a dioecious plant and is therefore either exclusively male (pollen -forming) or female (pistil bearing). The female plants have frosted, translucent, white appearance berries. Those are eaten by birds, especially thrush. The birds spread seeds through their feces or by sweeping their sticky beak off on a branch. It may take two to three years for the seed to germinate. In the first stage of life is mistletoe no (half) parasite, but as epiphyte that cares itself in the absorption of nutrients (which are then taken by the leaf from the air). 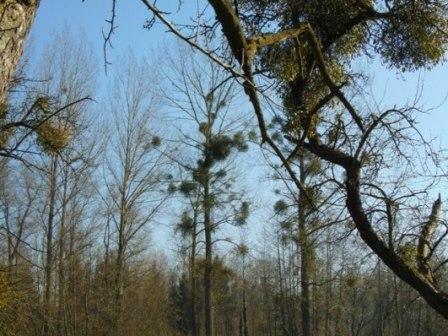 The mistletoe is a semi-parasite: it uses water and salts of the trees, but also contributes to its own photosynthesis. The berry is making a germ. The root bends to the branch in order to attach himself with an adhesive disc . Much more is not happening in the first growing season. The rest of the seed is released from the branch and will be placed above the adhesive disc. In summer grows out of the adhesive disc one germ root that pierces the bark of the tree. It penetrates the inner bark to the wood and then sends to all sides roots that grow under the bark. Out of this ”bark roots” later grow “sink roots” or ”sucking roots” that penetrate the young wood layer and go the longer the deeper. Before the winter is past, the roots must succeed in achieving the sap flow of the host. These semi- parasite gets water and salts from its host. In the second growing season, mistletoe makes only one pair of leaves. The following year are in the fork between the two leaves two short twigs formed, with at their end again also two leaves. Each year grows a new split from the branching of the year before. So the plant grows slowly and sphericity. It can take up to 70 years old and then has a diameter of about one meter. In winter the mistletoe has lack of water. The host supplies it hardly. Therefore, the leaves are leathery and resistant to drought for months. A cut branch therefore remains (even indoors) very long green. The mistletoe is entirely a very poisonous plant. The sticky berries were used to make (bird) glue that was smeared on branches and sticks. The method is often mentioned, but a real glue recipe I have found nowhere. Mistletoe maple (Acer) and elm (Ulmus) would provide a better glue. The berries should have to be heated, and mixed with oil. In order to make the glue water-resistant was possibly turpentine added. They were collected in the summer, and cooked gently in 7 to 12 hours. The green exterior was removed, and the remaining mass stored 2 (or 3) weeks in a covered moisty hole to ferment (and rot), and then mashed into a thick paste. All of the remaining wood fibers have to be crushed. All flakes are being wrought under running water. After another 4 to 5 days of fermentation and skimming the mass was boiled over a fire (and mixed in some regions with 1/3rd oil). Another trapping method of the Romans, but previously (and later) used, consisted of placing glue smeared paper cones or gourd. Especially in winter hungry corvids are curious enough to stab their head there, after which they can be caught easily.